Campcraft have been preparing the people of Bolton and the wider area for the great outdoors since 1964. That's almost 50 years for the family-run business, 50 years of quality products and excellent service. And, through it all, one member of the team has stood strong, a permanent fixture leading the way. Unfortunately, the team member has had to be retired from active duty, with less-strenuous life lying ahead, no longer having the rest of the team dump all their problems on them. That's right, Campcraft's office bin has developed a hole and has had to be withdrawn from action effective immediately. 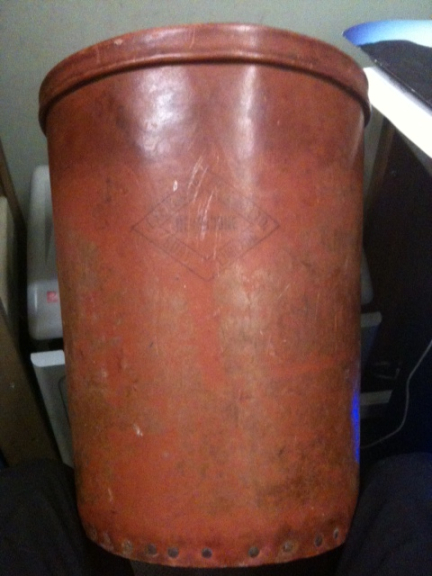 The bin was bought when Campcraft was opened in 1964, and has been used ever since in the office. It was purchased from another local, family-run business, Excelsior, the UK's leading rotational moulders. Excelsior have been running since 1896, and was one of the first to be incorporated under the Companies Act, over 100 years ago. This purchase is an excellent example of why the principle 'Buy Local' works so well. The bin was bought around 48 years ago, and has been functioning perfectly well all this time. Bolton and the surrounding areas are capable of producing great things, not just this bin, so why would you want to look further afield when what you want is right on your doorstep? And, to make matters even better, Excelsior have offered Campcraft a new bin, free of charge, in exchange for the old one. Quality products, and impeccable customer service is what happens when you use local businesses. The logo on the side of the old bin contains an old Lancashire saying at it's heart, "Never Done". Sadly, for the bin, it's time is done after almost 50 years. What isn't done, however, is the great relationship between Campcraft and Excelsior, which is stronger than ever. What isn't done is our aim to show you, the people of Bolton, that great things can happen when you buy local.